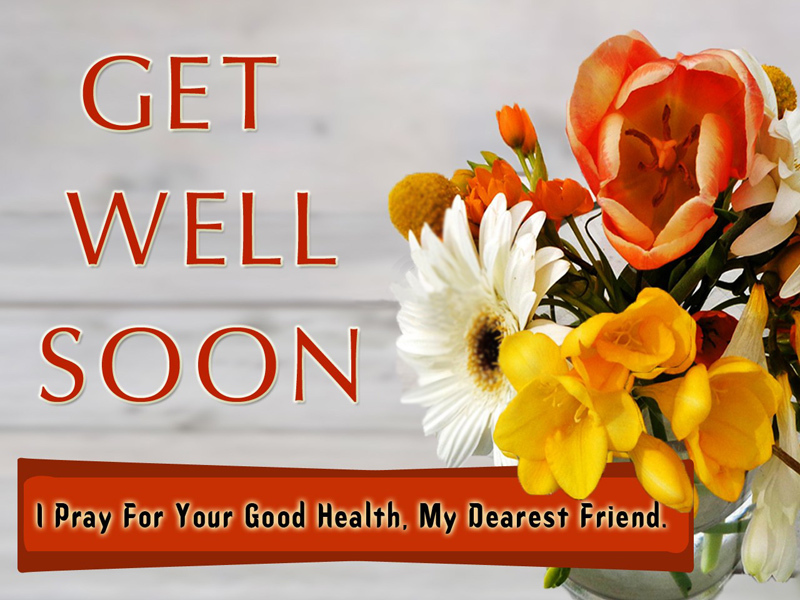 Get Well Soon Wishes : Let’s encourage your sick friend to fast recover from illness and wish him/her by funny and inspiring get well soon messages and feel better soon wishes! Best friends are those who need you in their difficult times. Make them feel better in their sicknesses and in the boring time in the hospital. Make them feel that you are taking care of their situations and wish them a speedy recovery. A strong and meaningful inspirational message can give them psychological confidence to get up on his feet. 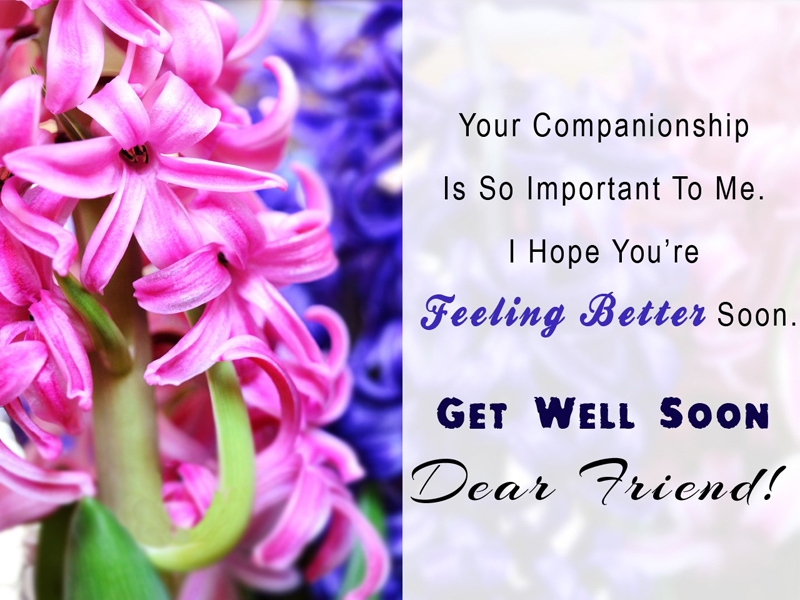 Send a funny get well wishes for friends to cherish them throughout their lives. 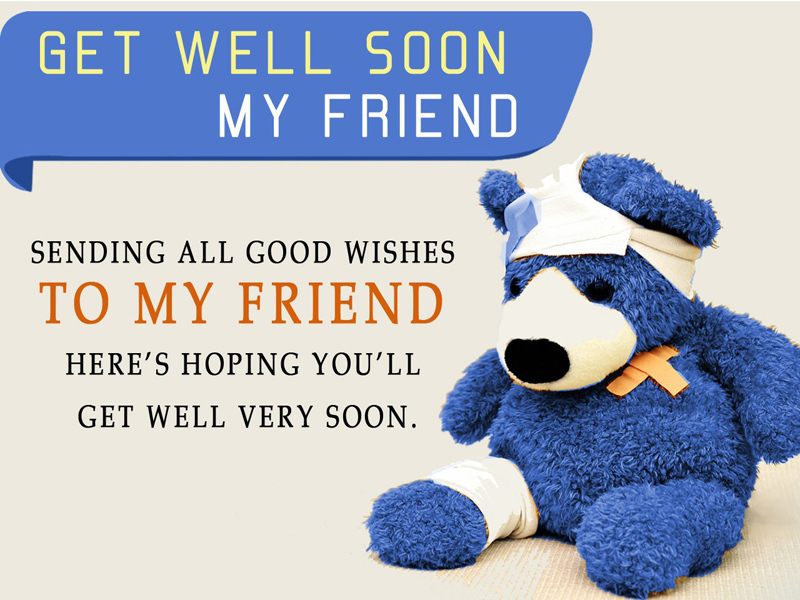 A meaningful and touchy get well wish for a friend can bring you even closer to them. 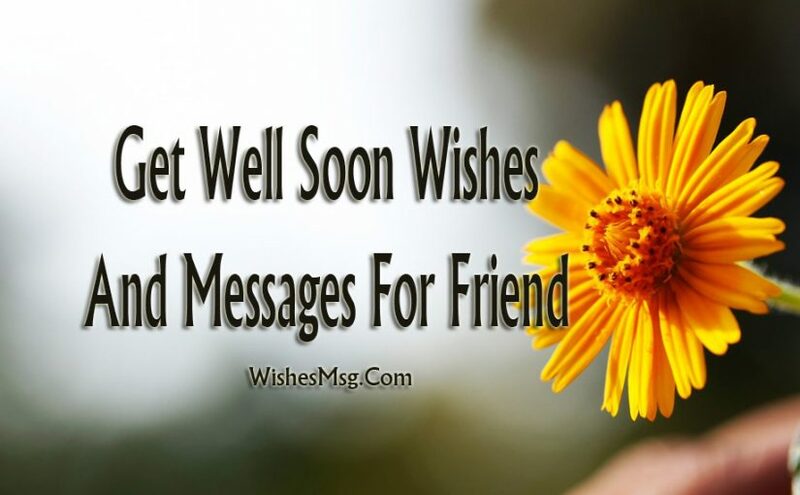 Send him a wonderful get well message and be with him in his/her unpleasant times. Dear friend, its been a great loss for us that we are missing all your smiles. Recover quickly and come back to us buddy. A doctor may heal from your disease, but a friend can heal you from your sufferings. We can feel you, friend…Get Well Soon! You don’t need any flowers or cards from me. I have given my heartful prayers, that’s what is friendship stands for. Get well soon! I miss all the fun and gossips we had together. Get over your sickness and come back among us. Miss you buddy! Do not forget that you can rely on your good friends who remember you and are willing to offer you their help for anything that you need. Take care and get well soon. My good wishes and vibes are always with you to fight in your sickness. I pray to god, that you get well soon enough to irritate me more. Passing the days without you be like having parties without any booze. The simplest appeal I can do is to pray hard to god that you get well soon so that we can have a drink together. I miss you so much and so does everyone else. We all miss you and wish you a speedy recovery. Take care and know that we are eagerly awaiting your return. Get well soon, my friend. I am sending loads of good wishes for your fast recovery and good health. I wish for a very better health for you. I send my best wishes for you to have a speedy recovery and do not forget that you can count with my help whenever you require it. I was always inspired by your struggle. You are a warrior. Hope you can fight through your extensive sickness. God will always accompany you to overcome the devils. Your sickness will soon be overcome by your confidence. Get well soon, we miss you, buddy. I have never seen a person like you with such a willpower. You can overcome this accident and will come back to your feet in no time. Our good wishes are always with you. You might be sleeping alone in the hospital bed and thinking you are struggling through this alone. But always remember you are our closest friend and our support and courage are always with you. Get well soon buddy and come back. We are missing your companionship. You are the only one who can motivate me during my hard times. I might not say the same as you might do in the sickness but my prayer and well wishes will always be with you. Get Well Soon, friend. Among my friends, you are the only friend who always showed good intentions. In your hardest time of sickness may god be with you with all his powers. Through this text message, I send you warm wishes for your fast recovery, my dearest friend. I am praying for your comfort and healing from your sickness. Wishing you a speedy recovery dear friend. I pray to God that you feel better through each passing day. Hope you resume your normal life soon. I wish you could remain sick for some more days so that I don’t need your return your money. Jokes apart, you are my best friend. Wish you a speedy recovery. You are the coolest friend among us, so the hottest fever needs to get away to bring you on feet. Come back we will flirt with girls together. Thank God, I am happy that you are sick. Now you can have a sound sleep and worry less about your life. Anyway, Get Well Soon! You need to start worrying about the studies soon! I know you are not sick, you are taking a break from the professor’s pressure. Stop sending us those stickers, we can see through, come back quickly. We are really missing you. You are lucky to get all those fruits and flowers for free. Don’t eat them all up! I am coming! Get Well Soon We need to hang out again together. Don’t make your fever is as contagious as your smile. I will never forgive you. Get Well Soon from the boredness of the hospital bed. I am waiting on the campus for you. It came to me like bolt from the blue that you had an accident. Here I am with a banquet of flowers in hand and Get Well Soon in the heart. Sending you a handful of chocolates and mindful of prayers for your hardest time in the hospital. Get Well Soon, friend! Never lose hope and the strongest confidence you have in this sick time. You will soon recover. God is always with the bold. Get Well Soon! In your hardest and time, hope and prayer is your best medicine. Have good faith and recover quickly friend. So like girls, germs also find you irresistible. Remove the germs and sickness and get up in your feet. Sending you a morning sunshine, chirping of birds and a heartful of prayers. May God help you recover and make you as fit as before. Get Well Soon buddy! Doctors are only to find out a disease that is causing you pain, but only a true friend knows your suffering. Wishing you a fast recovery. I am sure being tucked in bed is not the best thing you know to do. All your friends are waiting for you to get out of bed and say ‘I am back in action’. Get well soon! I am so sorry I cannot go to visit you, but I want you to know that I always think of you and pray for you to recover soon. Wishing you a really fast recovery. Not only because you are my dear friend but a good human too. You don’t deserve to be sick. May God erase all your illness and you are healthy again. I pray to Lord to recover you faster so that you can be on track of good health. Get well soon, friend. 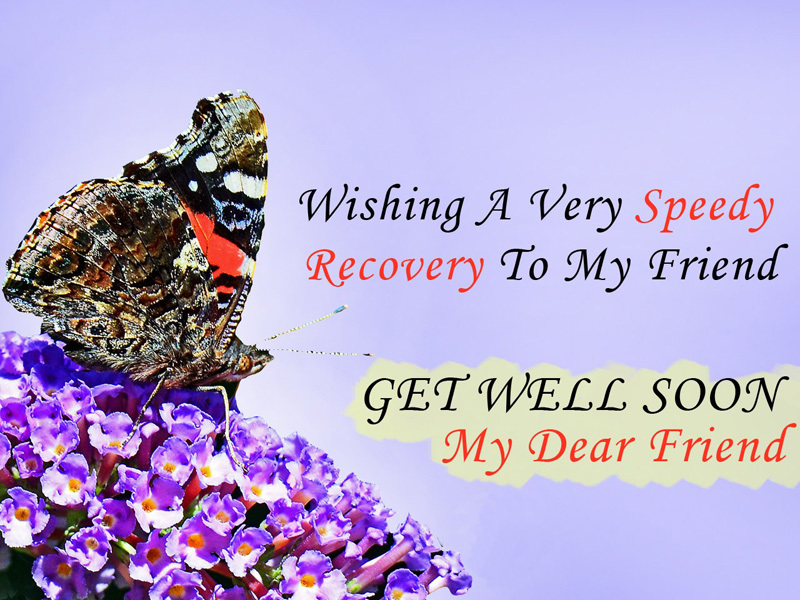 These get well soon messages for friends will help you to cherish your friend in times of illness and will be the perfect way to keep them cheerful during this difficult time!